Worms Can Recycle Your Garbage is a new video in the Homegrown From NC State Extension News series. 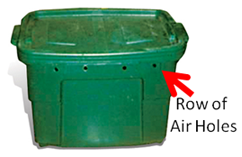 In this brief video, Rhonda Sherman shows how to set up a worm bin to recycle food waste at home or in a classroom. Vermicompost products have many applications, including home gardening, landscaping, turfgrass, golf courses, DOT projects and in agriculture.